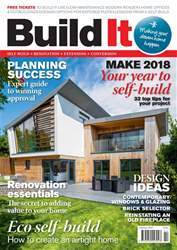 2017 was a positive year for self-build.the number of us commissioning our own bespoke homes has risen to 13,000 – inching back towards pre-credit crunch levels. And the latest news from NaCSBA is that 33,000 individuals and groups have now signed up to councils’ Right to Build registers. As Mike Hardwick reveals on page 130, these lists could be a gamechanger for people who want to self or custom build, as local authorities must permission enough serviced plots to meet the demand indicated on their registers within each allotted three-year period. This has the potential to bring a steady stream of viable sites onto the market – but it’s early days and there are challenges.